Gokarna Forest; David McLay Kidd's first solo effort. 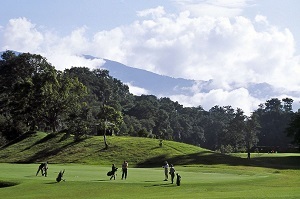 There are plenty of countries where you'd never consider playing golf, if you ever visited them at all. North Korea, Iran and Iraq would probably be involved in a three-way playoff for the right to be considered No.1 on your list, while Greenland, Mongolia and Turkmenistan might be right up there. How about Nepal? Until 1999, the former monarchy with the weird twin-triangular flag which became a democratic republic five years ago following a decade-long civil war between the royals/government and the Maoists, had half a dozen courses. Most were private nine-holers that only negative/reverse green fees might induce you to play, though there was one course – Himalayan GC, a scruffy but fascinating layout built by a former British army man outside Pokhara in 1994 - whose surroundings were so impossibly magnificent a game there was definitely worth scheduling. In 1996 though, the strangest thing happened. Suman Sachdev a successful international businessman with interests in Nepal, India, Thailand and Dubai, contacted Gleneagles Golf Developments (GGD) with a view to adding a golf course - not just another unremarkable nine-holer but something that might attract golfers from all of Asia - to the hotel/resort complex he owned in the Gokarna Forest Reserve on the banks of the holy Bagmati River, about half an hour northeast of Kathmandu. Gleneagles Golf Developments, led by the famous Scottish resort’s development manager, Ian Ferrier, and the Director of Agronomy, Jimmy Kidd, had aimed to create ten or so Gleneagles-type resorts around the world. The recession of the early 1990s made such a vision unrealistic, however, so the company was forced to downsize its mission. Instead of building grand, 232-room hotels with multiple golf courses, equestrian centers, spas, tennis facilities, clay-pigeon shooting schools, falconry schools, etc, it ended up offering only its golf course design and construction services. The company’s first job in the US became rather well known. You may have heard of it – Bandon Dunes in Oregon which Jimmy’s son David designed. That project had started in the summer of 1994 when the Kidds began hacking their way through 250 acres of gorse to reveal what eventually became the wonderful first course at the Bandon Dunes Golf Resort. Somewhere in the middle of all that though, GGD got the call from Nepal. Two years after the course opened, nine members of the Nepalese royal family were massacred by the heir to the throne, Prince Dipendra Bir Bikram Shah Dev (who also shot himself), apparently in a fit of rage over his parents’ choice for his bride. That, along with all the political unrest in the country, not to mention his growing workload, prevented Kidd from ever returning to Nepal to see the course he designed. I was fortunate to play it in 2008, round about the time Nepalese citizens were choosing Ram Baran Yadav to be their first democratically-elected President, and can assure Kidd the course turned out very well. If you said you could recognize the Scotsman’s hand in its design you’d be lying, but there are fun, quirky, exciting holes here that he and only a handful of other architects would have had the vision and courage to build (mind you, Kidd probably didn’t feel he would need to impress the golf media in Nepal as much as he might in the US or UK for instance). Suman Sachdev assures me the country is peaceful now, and though you might not buy a ticket from Denver to Kathmandu purely for the purpose of playing Gokarna Forest, I would certainly recommend you take your sticks if you happen to be heading that way. The course is great fun, and even Americans who live near the Rockies or Cascades and who know a thing or two about mountain views, will walk it in awed silence. And while you’re in Kathmandu, don’t forget to book a seat on a Buddha Air or Yeti Air flight that will take you from Tribhuvan International airport over the Himalayas and past Everest (or, as the locals call it, Sagarmatha. Tibetans – the mountain is on the border between Nepal and Tibet – call it Chomolungma) for perhaps the greatest mountain view of all.